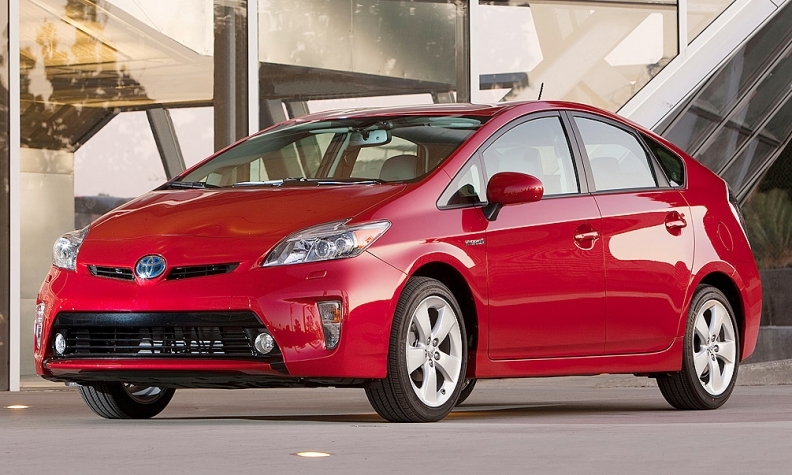 Toyota boosted Prius incentives to $2,300 per vehicle in September from $1,400 a year ago. For a sign of the challenges in selling fuel efficiency as a virtue, Tanner Hulette need only look at the signs near his dealership advertising gasoline for $2.70 a gallon. Hulette, general manager of Mechanicsville Toyota near Richmond, Va., said he's seeing higher demand for pickups and SUVs, and less interest in the Prius hybrid. The store's year-to-date light-truck sales are up 5 percent while car sales are down 5 percent. "The floor traffic is dictated by what's going on with fuel," Hulette said. "If we didn't have SUVs and light trucks right now we'd definitely be feeling some pain." The national average price of gasoline hit $3.14 per gallon last Friday, the lowest level since at least February 2011, after falling 10 cents per gallon last week alone, the fastest rate of decline in roughly two years, according to AAA. Gasoline prices tend to decline every fall, but the recent drop highlights what analysts and economists see as a broader trend toward moderate and more stable fuel prices in the U.S., one fueled by the boom in U.S. oil production, a more efficient fleet and softening global demand for oil. Ford boosted C-Max incentives, but the move failed to improve sales. The U.S. Energy Information Administration, the Energy Department's research arm, says gasoline prices will fall from a projected $3.45 per gallon this year to $3.38 next year, which would be the third straight year of lower prices. "You average out all the refinery outages, geopolitical issues and other short-term fluctuations and that brings you back to the fundamentals, which are you have a lot of oil," said Energy Information Administration economist Sean Hill. He added: "We've been expecting gas prices to fall gradually, and they have been, and we don't see that changing." Meanwhile, dealer lots are flush with hybrids and fuel-efficient small cars developed over the past several years in anticipation of continued oil shocks and higher federal mpg standards. 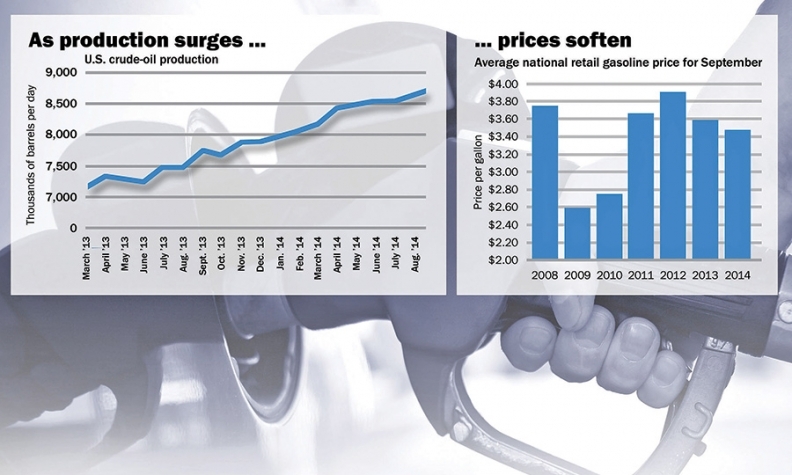 As fuel prices drop, those vehicles increasingly need a push out the door. Alternative-powertrain vehicles, which once commanded a significant premium over their gasoline-powered counterparts, now come with heavy incentives. Data from KBB.com show that Toyota boosted Prius incentives to $2,300 per vehicle in September from $1,400 a year ago while Ford ramped up C-Max spiffs to $4,900 from $2,650 per vehicle in the same period; neither move helped sales. "It's just difficult to justify paying a premium for an alternative fuel when the payback on that takes forever," said Dave Zuchowski, CEO of Hyundai Motor America. Even before the recent fuel-price drop, consumer tastes were shifting toward SUVs and pickups and away from electrified vehicles. "We see nothing right now that will reverse that trend," said Eric Ibarra, senior analyst with Kelley Blue Book. Despite their low volume, alternative-powertrain vehicles are central to automakers' plans to comply with toughening federal fuel economy standards. If low prices persist, Ibarra says, "manufacturers may be put in a position where they have to produce cars that consumers don't want to buy." Dealers aren't concerned yet, saying consumers remain vigilant about the risk of another oil spike, even as they gravitate toward trucks. "Sometimes I think there's some short-term amnesia," said Mike Maroone, COO of AutoNation. "But when you're planning out a purchase you're going to keep for four or five years, I think you recognize there's going to be peaks and valleys, and fuel efficiency is still a pretty big driver." David Kelleher, president of David Dodge-Chrysler-Jeep-Ram in Glen Mills, Pa., said fuel economy remains on customers' minds "because they don't know when that other shoe's going to drop." Adam Arens, owner of two Patriot Subaru stores in New England, said consumers tend to react more when prices go up rather than go down. "The difference between $3.50 and $3," he said, "is dramatically less than the difference between $3.50 and $4." Jamie LaReau and Amy Wilson contributed to this report.